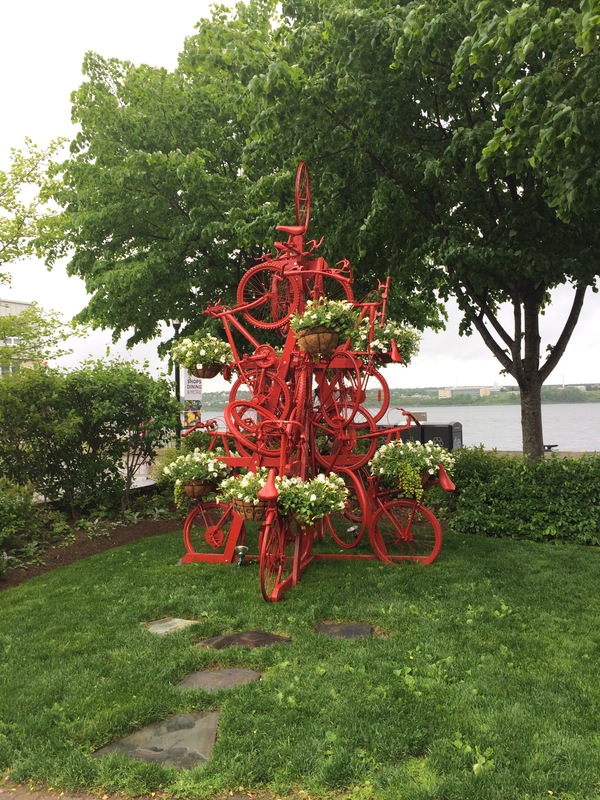 Have you ever stumbled upon something in or around your community that you never knew was there and didn’t expect to find? 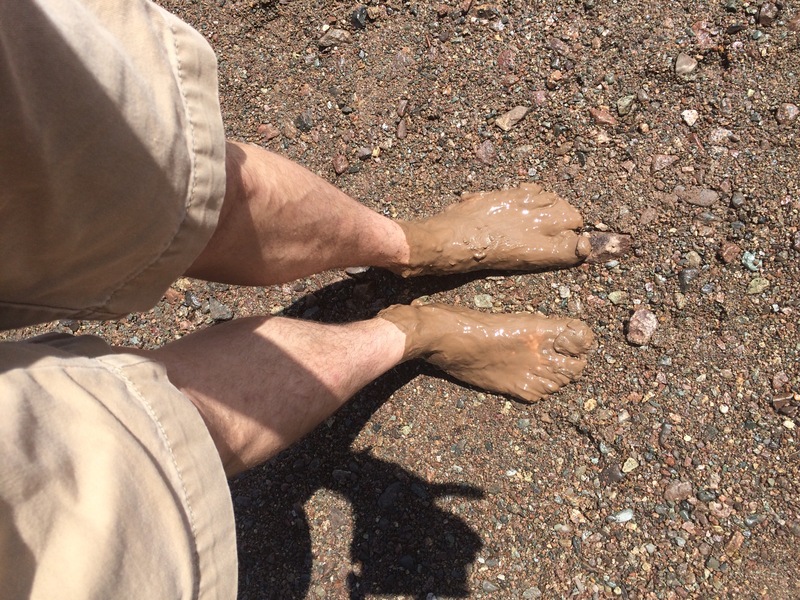 I never expected to find a black sand beach in the Maritimes. I’ve never seen a black sand beach, except in photos. So, a short time ago when I saw a picture posted on Instagram of Black Beach in Lorneville, just a few kilometers from my home, I knew I had to check it out for myself. Black sand beaches are rare in this part of the world. They are most commonly found in areas of volcanic activity, such as Iceland, Hawaii and the South Pacific. 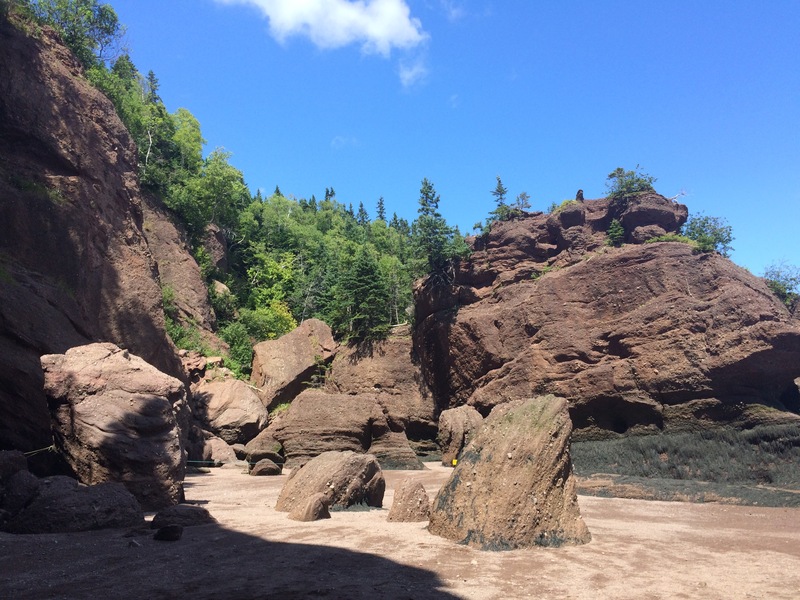 Black Beach is located in the community of Lorneville, NB, about 19 km from Saint John. The colour of the sand is derived from graphite deposits. 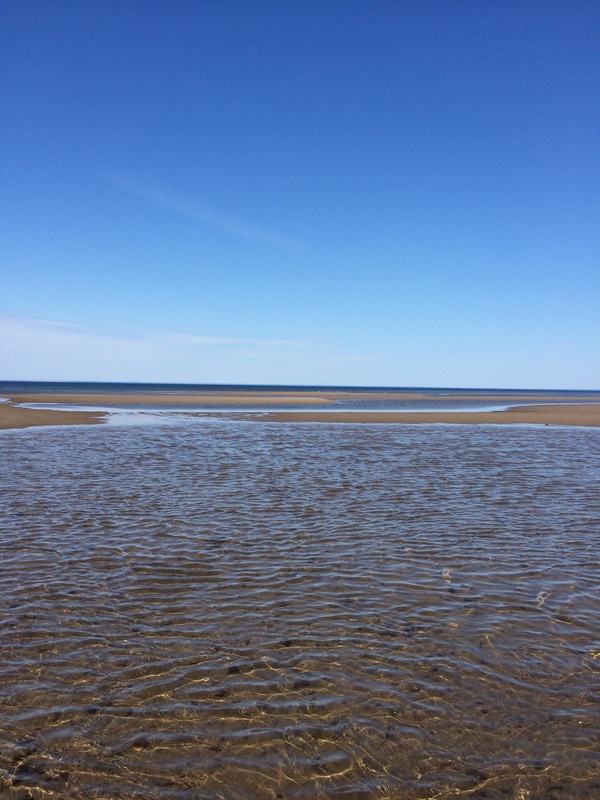 The beach is located along the Musquash Estuary, one of the most biologically productive areas in Atlantic Canada. Over 4,000 acres of the estuary is protected by the Nature Conservancy of Canada (NCC). 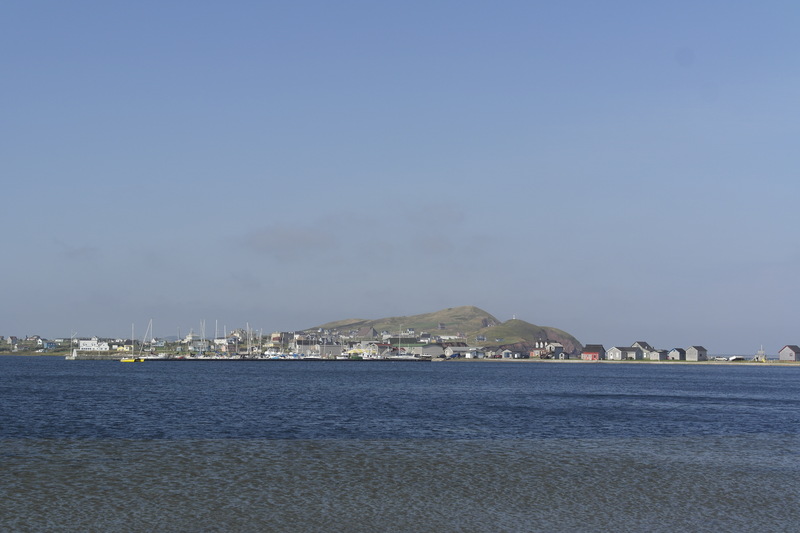 Known for its biodiversity, the Musquash Estuary is home to numerous species of birds, fish and terrestrial wildlife. 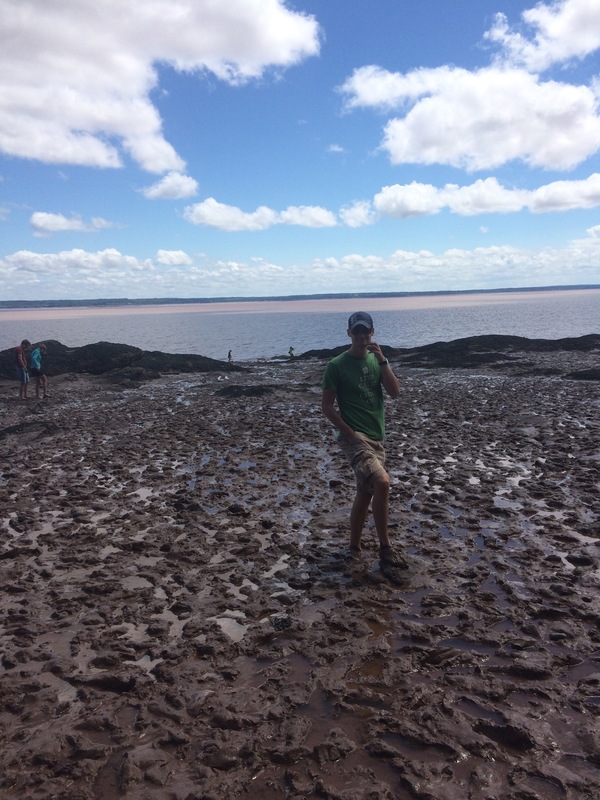 It is the last fully functioning estuary in the Bay of Fundy. 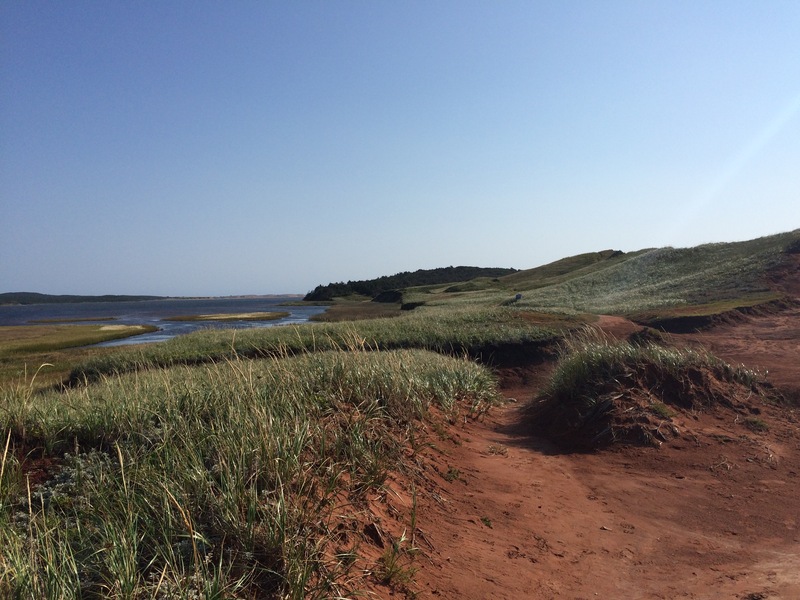 Two hiking trails are located in the area, maintained by the NCC: Black Beach trail and Five Fathom Hole trail. 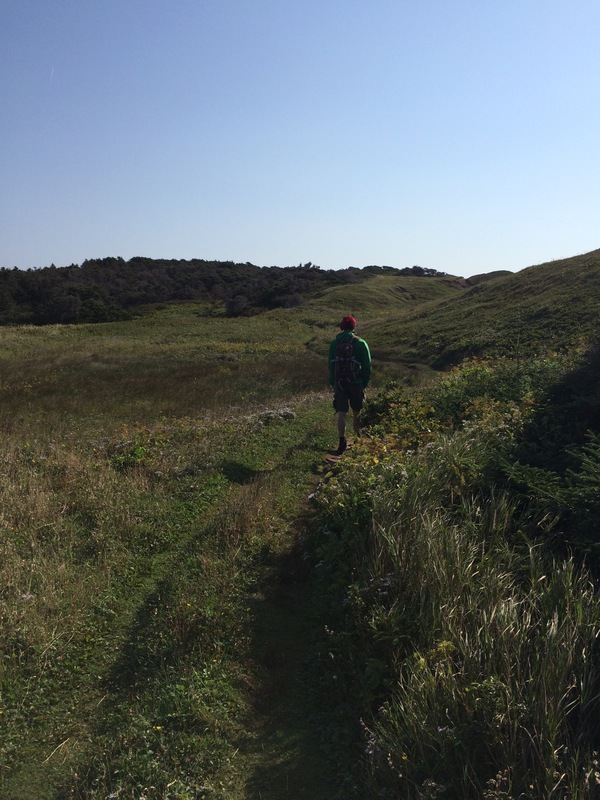 Joel and I hiked the 4.2 km loop of Black Beach trail a couple Saturday’s ago. 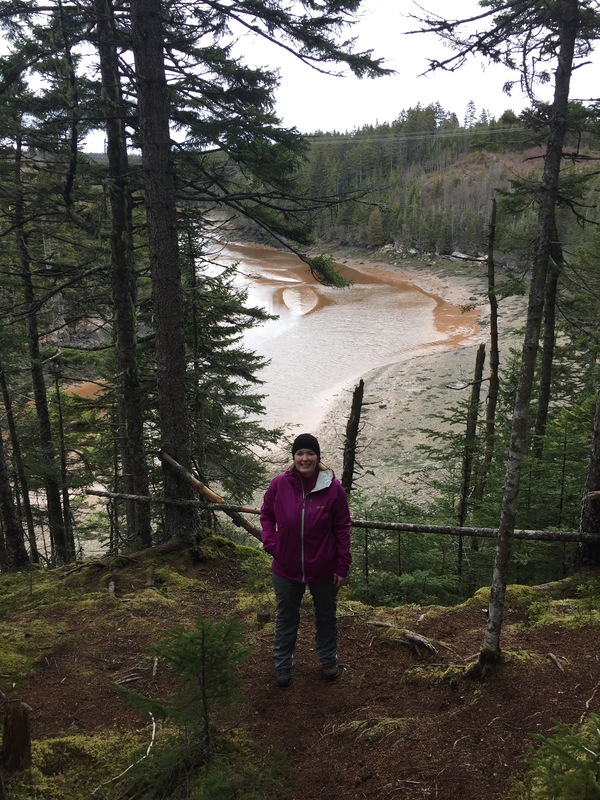 It’s a lovely hike through the forest with great views of the estuary. We didn’t get to see a lot of wildlife, but it was quite windy when we were there, so we’d like to come back in the summer when the weather improves and we have more time to spend nature-watching. I love the thick moss carpet that lines much of the trail. It provides a splash of colour, even in this brown period between winter and spring. It was cold on the beach so we weren’t able to stay long but this area is so unique and special, for its black sand as well as its ecological importance. I encourage you to explore the area and discover the beauty you might not have even known was there. Just make sure to leave the area just as you left it. Black Beach in Lorneville, NB. Looking across Musquash Harbour on a grey day. Checking out Black Beach from the top of the hill. 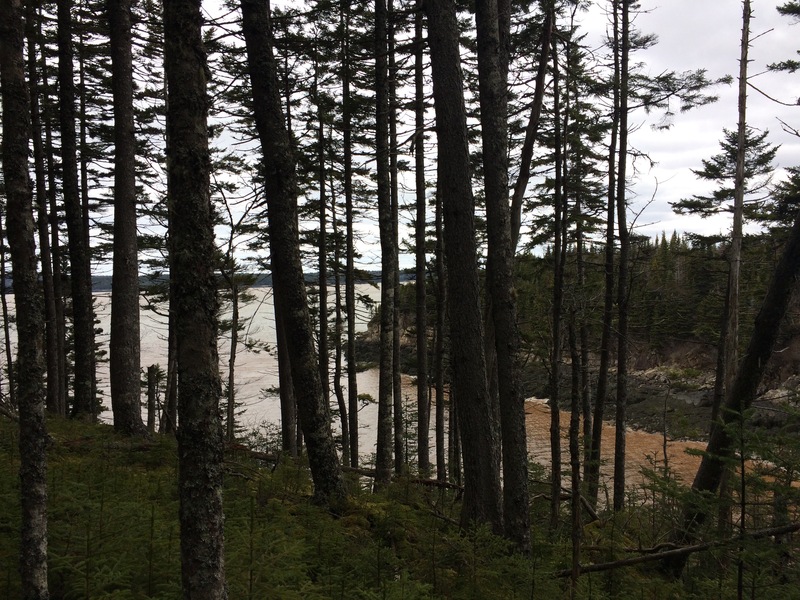 Much of the bottom side of the trail loop has views of the Musquash Estuary, protected by the National Conservancy of Canada. Tree trunks and moss for miles. This is my kind of place. 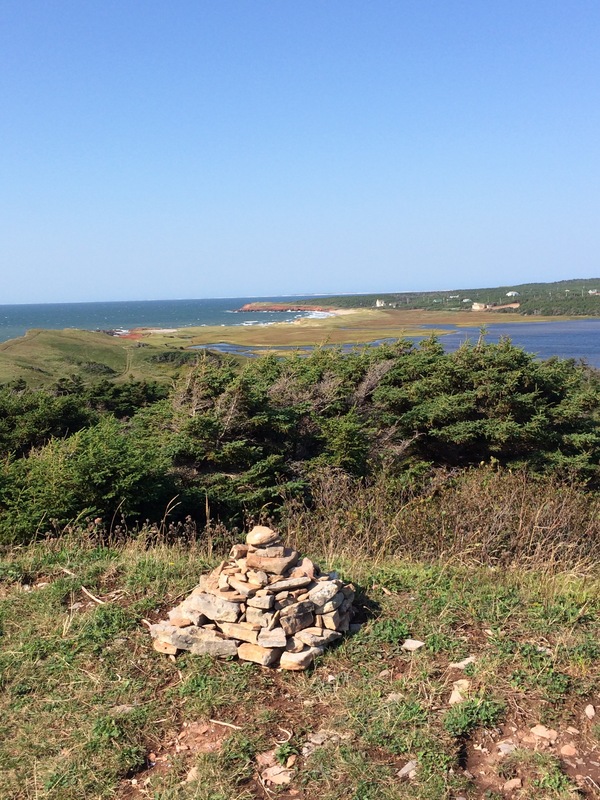 At the end of the trail loop is a great lookout over the estuary. Getting a closer look at that surprising black sand. Mine are the first footprints of the day at Black Beach. 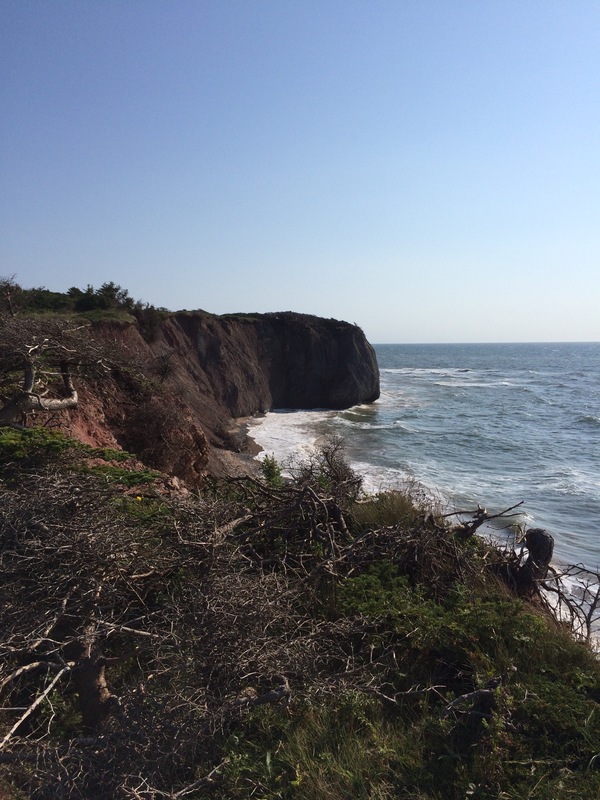 If you’d like more information about Black Beach and/or the Musquash Estuary, please visit www.natureconversancy.ca. 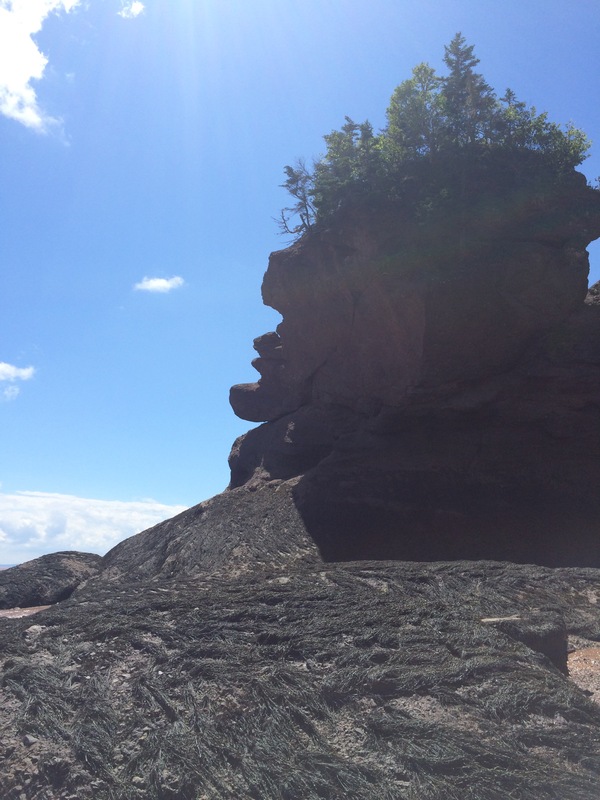 Do you know of a surprising find in the Maritimes? I’d love to hear about it? 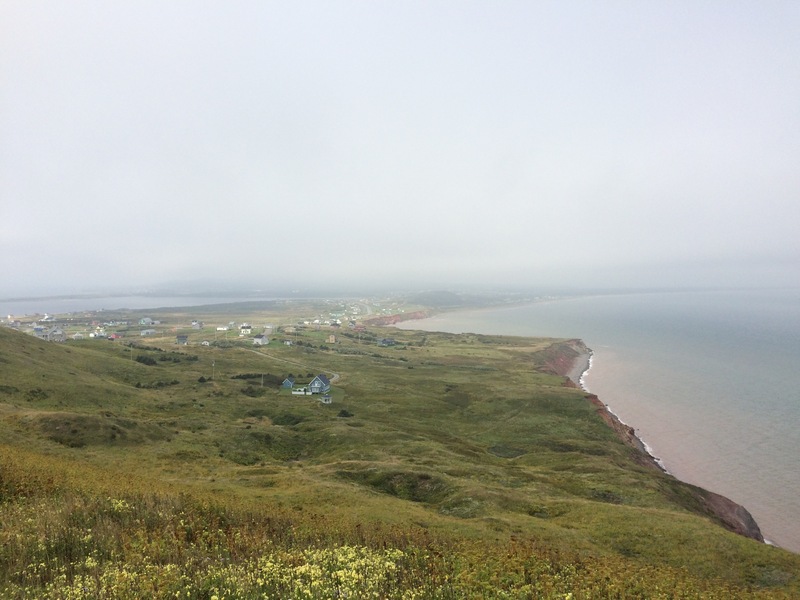 Our second day on the Magdalen Islands was all about working off that incredibly decadent seafood risotto and maple syrup souffle we had at La Table des Roy the night before. And work it off we did. 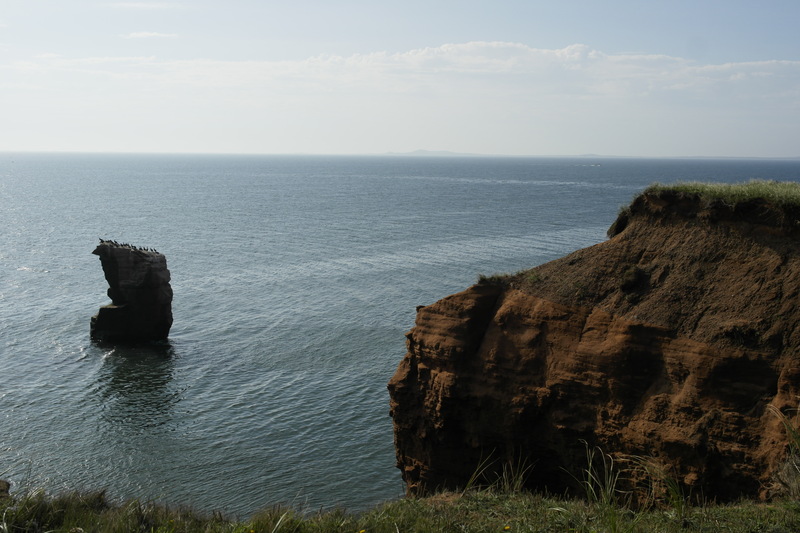 Our first stop of the day was to explore the beautiful red cliff views at Le Gros Cap (you can never have too many cliff views). After that we drove down to the other end of highway 199. We strolled around the marina among the quaint shops and cafes at the historical site of La Grave. We then hiked to the top of the hill at Butte Les Desmoiselles for a panaromic view of the area. It was starting to cloud over at that point. Then back down the hill for lunch at the quirky and charming Cafe de la Grave. We needed a little rest after all this exploring so we made our way back to our room at the Auberge Madeli. The Auberge Madeli is a very comfortable and modern hotel with a great location, almost a stone’s throw from the CTMA ferry terminal. 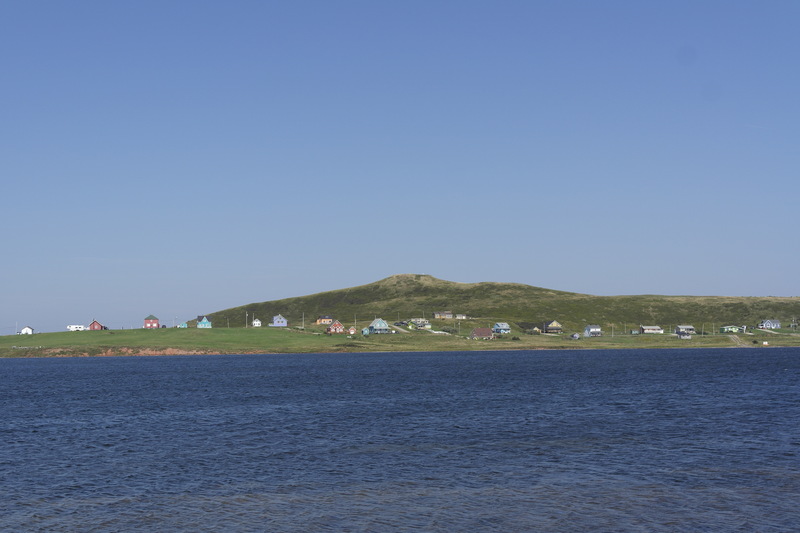 It’s located on Cap aux Meules, the most populated island in the archipelago and was a great home base for us on our travels around the islands. 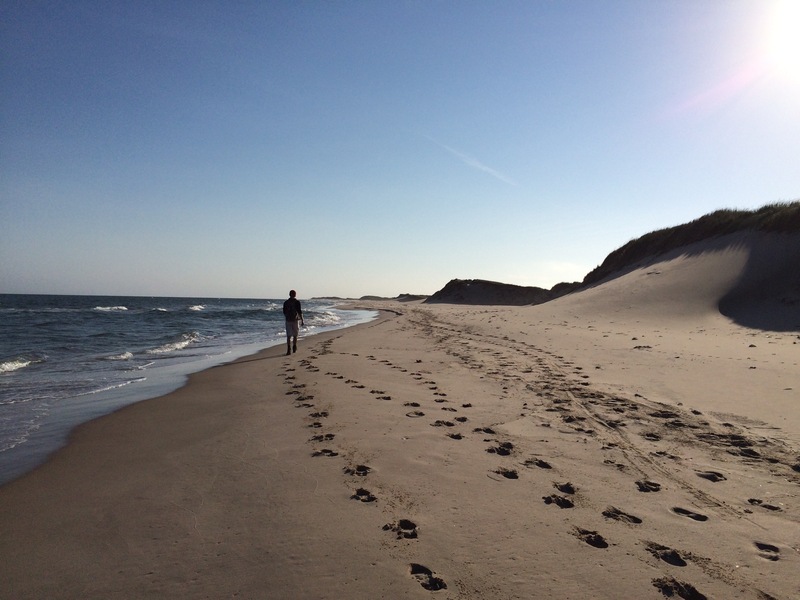 After a little rest, we checked out Parc des Buck but as these are mostly forest trails and didn’t really have the sea views we were craving we quickly jumped in the car and ended south again, this time in search of the very southern tip of the island, Sandy Hook. We parked the car, climbed over the sand dunes and stood in awe of the miles of white sand beach that lay in front of us. We started out, determined to make it to the end of Sandy Hook, where the islands meet the sea. We walked for what seemed like forever. I hate to say that there is such a thing as too much of a beach walk but I think we found it. After walking 6km we finally made it to the end of the sand dunes. 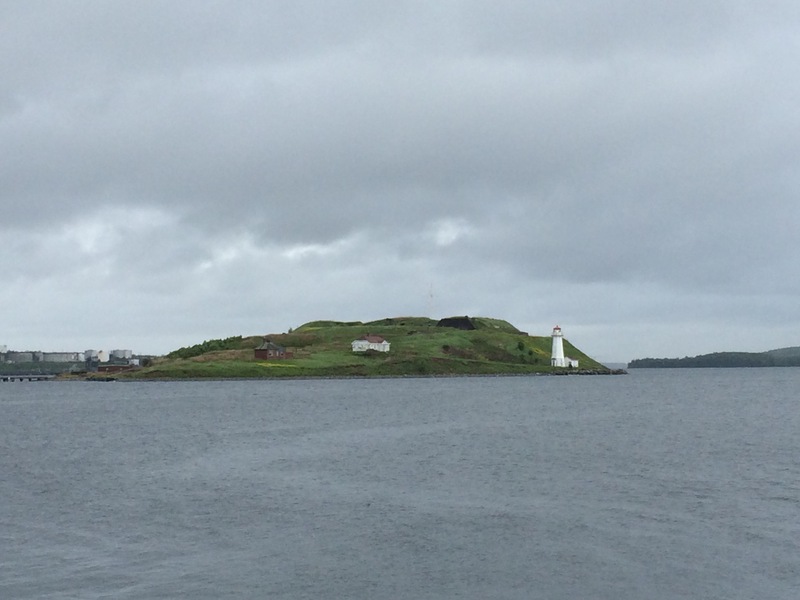 There is a nice view of Entry Island from here, as this is the closest point to it from the archipelago. 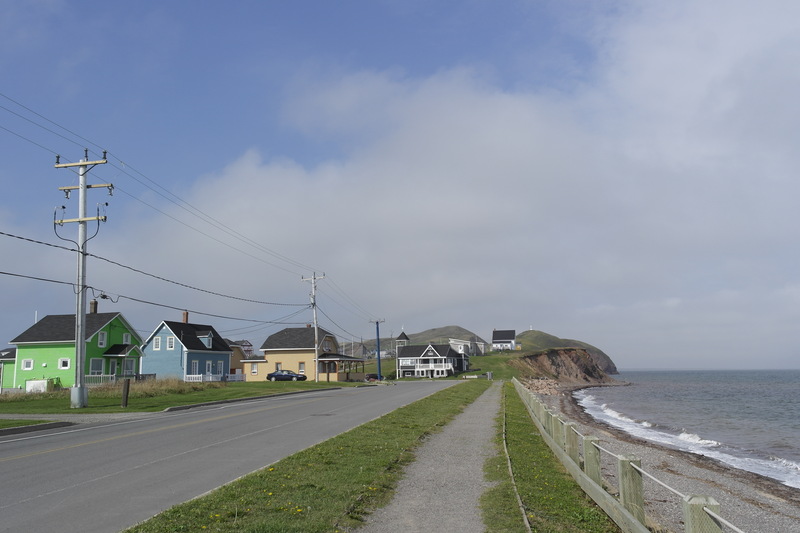 After hiking the 6km back to the car, we were hungry and tired and really quite sandy so we booted back to Cap aux Meules and settled on Les Pas Perdus for dinner, which seems like a hot spot for locals and tourists alike. 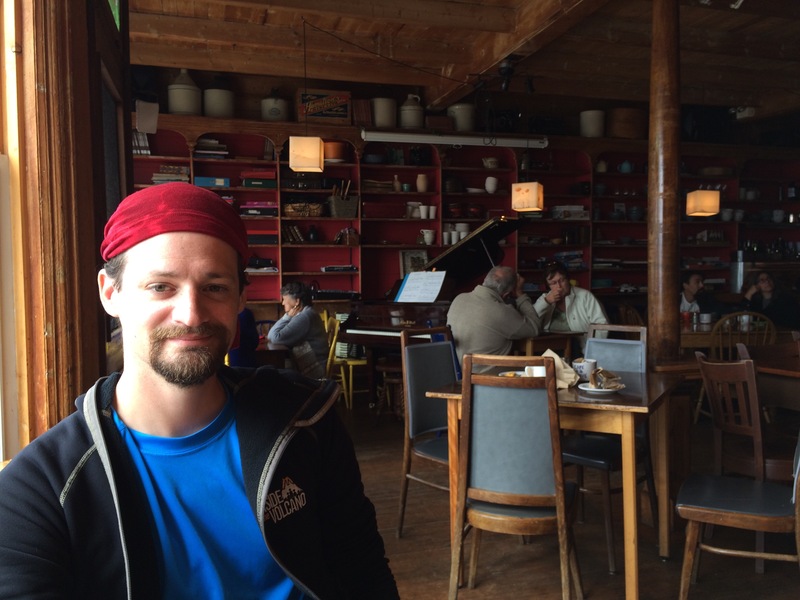 I was really happy because I got to have a gluten free burger, hard to come by on the islands. And after almost 20km(!) of walking that day, a burger and fries was well deserved. 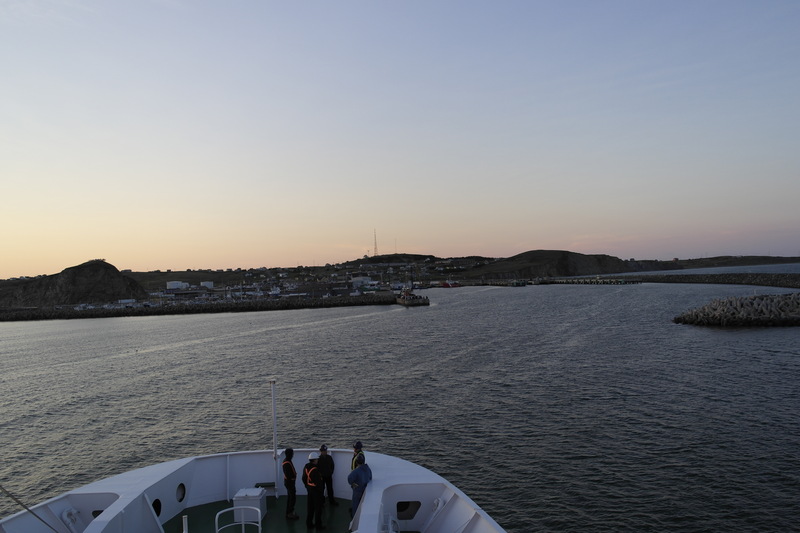 That pretty much wrapped up our trip to the Magdalen Islands. After dinner, it was time to return to the hotel and pack up for an early call at the ferry terminal the next morning. If we had had more time on the islands, I would have made the short ferry trip over to Entry Island. 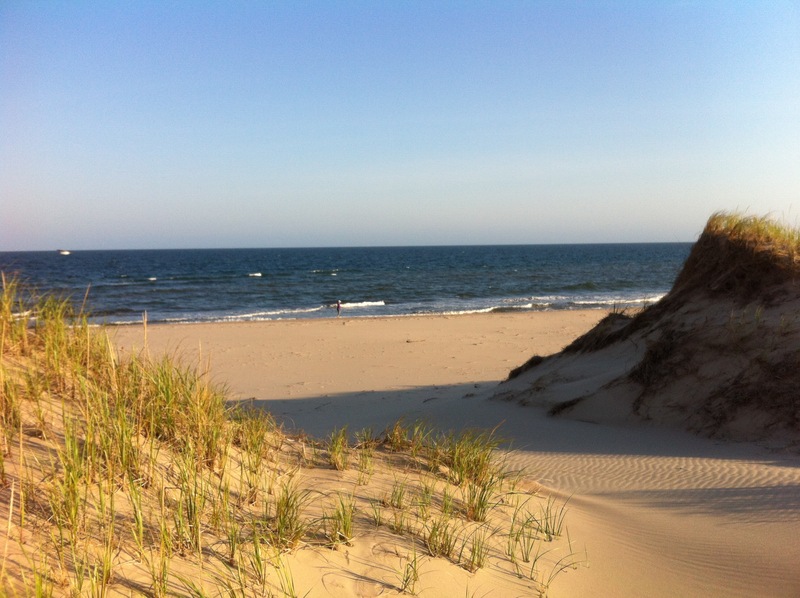 I would have loved to hike Big Hill and see Sandy Hook from that perspective. There are some other things we would have liked to do as well, like the stairs at the Cap aux Meules port. I don’t mind leaving a few things undone however, I feel it encourages a return trip. And the Maggies are definitely worth a return trip. We didn’t have to pay an entrance fee to any of the parks, beaches or attractions that we visited. I absolutely love that and think other provinces should take note. It encourages visitors to explore the islands freely and at their own pace. Speaking a least some french is helpful but not required. Most Madelinots speak at least a little english and are very friendly and welcoming. Thankfully my husband’s french is very good, so we got along just fine. The Maggies are the kind of place that encourages you to go further – we were determined to venture to the furthest edges of the archipelago that we could reach. It’s a wonderful place for those with an adventurous spirit. 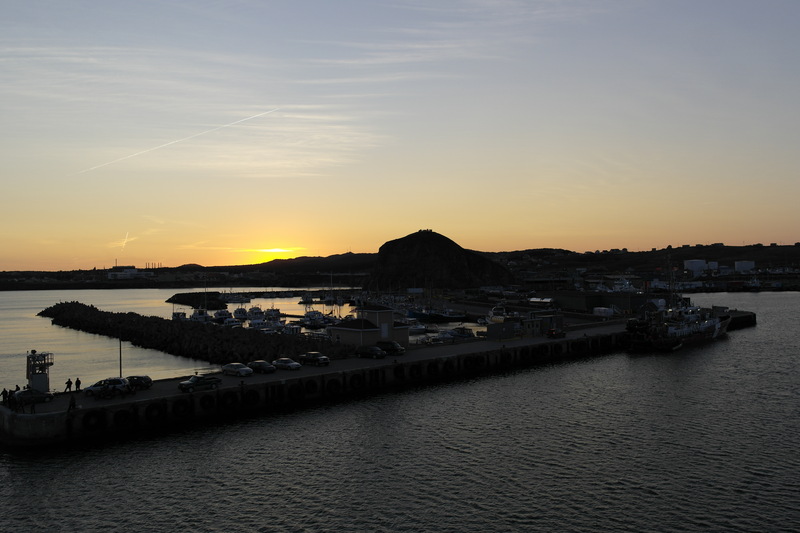 If you haven’t made a trip to the Magdalen Islands yet, what are you waiting for? 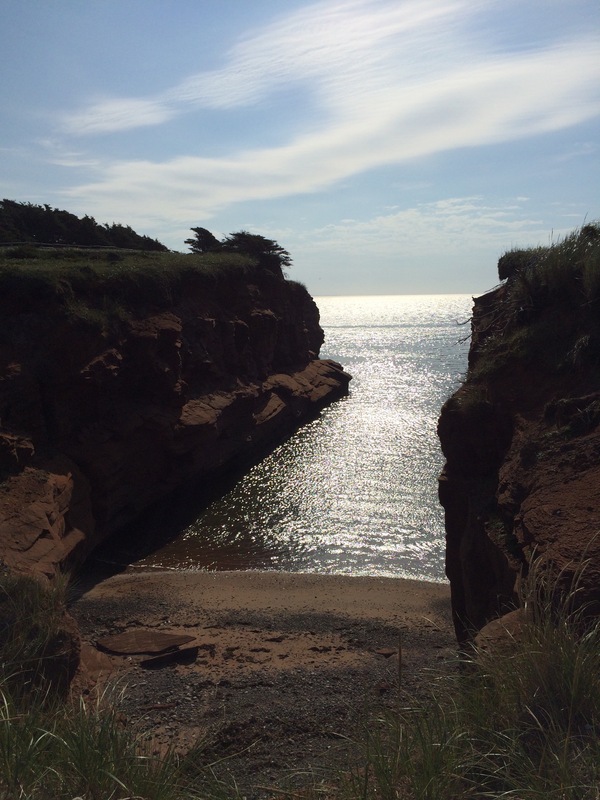 I would encourage anyone from the Maritimes and beyond to visit this paradise-like gem a least once. You won’t believe the surreal landscape you find yourself in, and you won’t ever want to leave. Thank you to everyone who made our trip such an memorable experience. 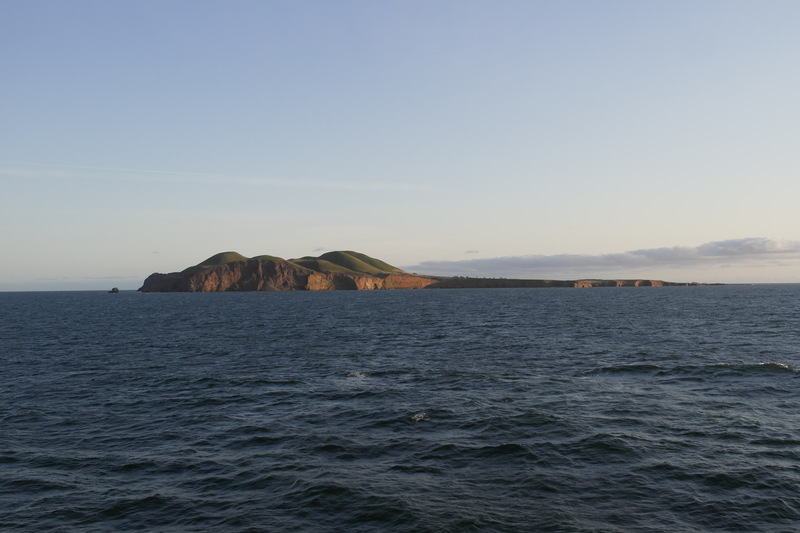 Yes, I’m aware that the Magdalen Islands (also known by its proper french name: Iles de la Madeleine) is not part of the Maritime provinces. 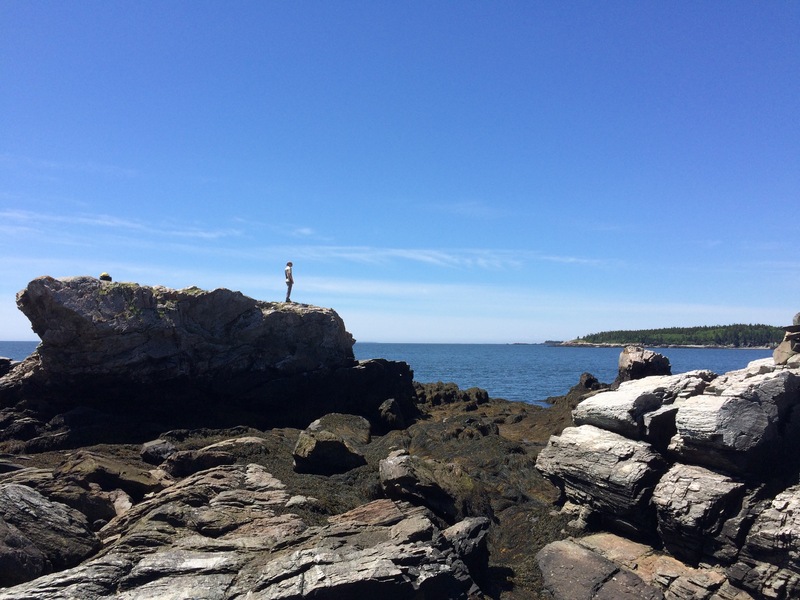 Geographically located in the Maritimes but technically part of Quebec, this little hidden gem of an archipelago is close enough for me. The powers that be in Quebec seem to think so too, because the islands are classified as part of their Quebec Maritime region. 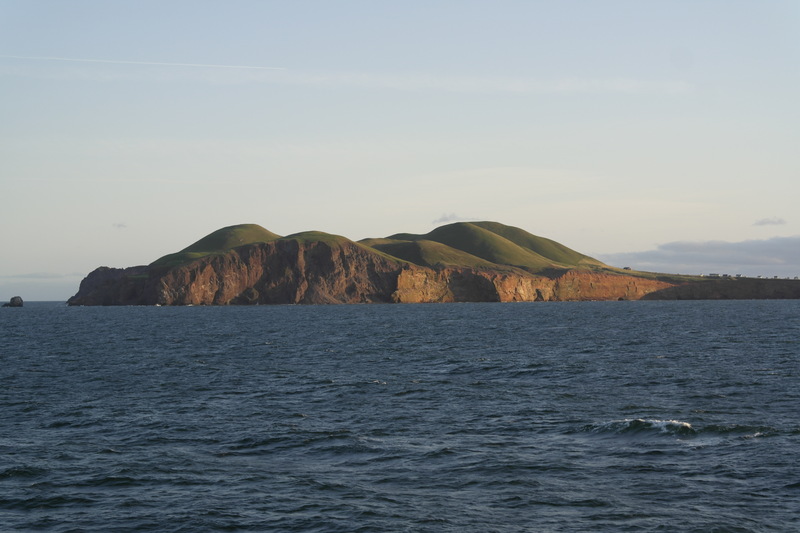 The Maggies charm and awe from the very first moment you glimpse Entry Island from the CTMA ferry: with those treeless, grassy hills, those towering red cliffs and those tiny, colourful houses dotting the countryside. It sets the tone for the rest of the islands. First glimpse of Entry Island. The only island in the archipelago not connected. Our arrival is so well timed at sunset. 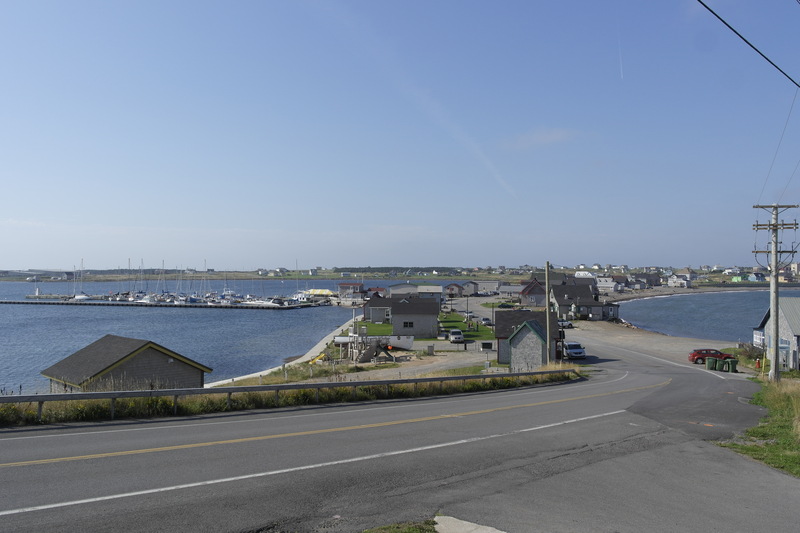 With our home base on Cap Aux Meules, we decided to take our first day to drive east on highway 199, which stretches from tip to tip of the archipelago. It was an incredible drive. Between each towering, green island lay kilometres of sandy dunes, with white sand beaches and crashing waves just beyond. I wanted to stop the car every other minute to get out and take pictures. It was a wonder we made it to the end at all. 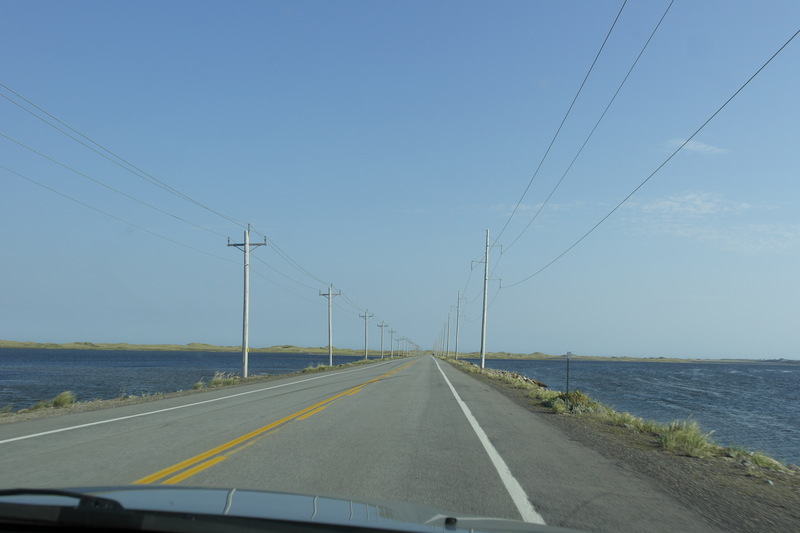 Lots of long, flat stretches between islands. We drove all the way to the east end of the 199, finding most restaurants closed for the season. 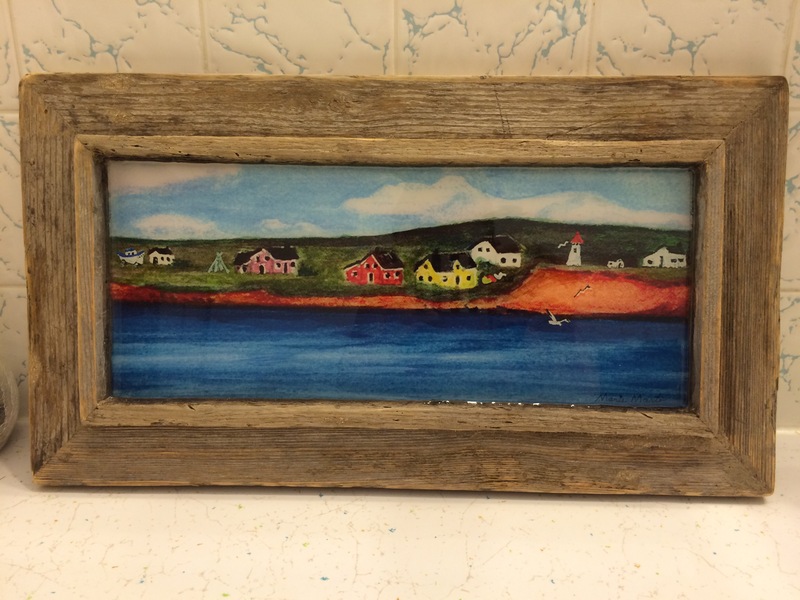 However, local artisan Marie Marto was still open and we bought a couple of her pieces to take home. 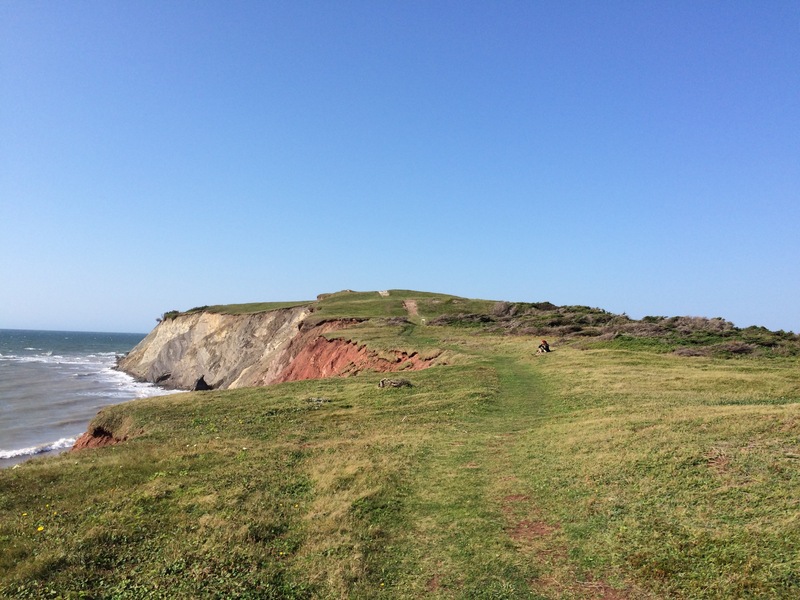 We also hiked across the (very windy) beach to Boudreau Island (actually more of a peninsula) where we trekked through wildflower meadows and stood cliff side, overlooking the Atlantic Ocean in all its ferocity. 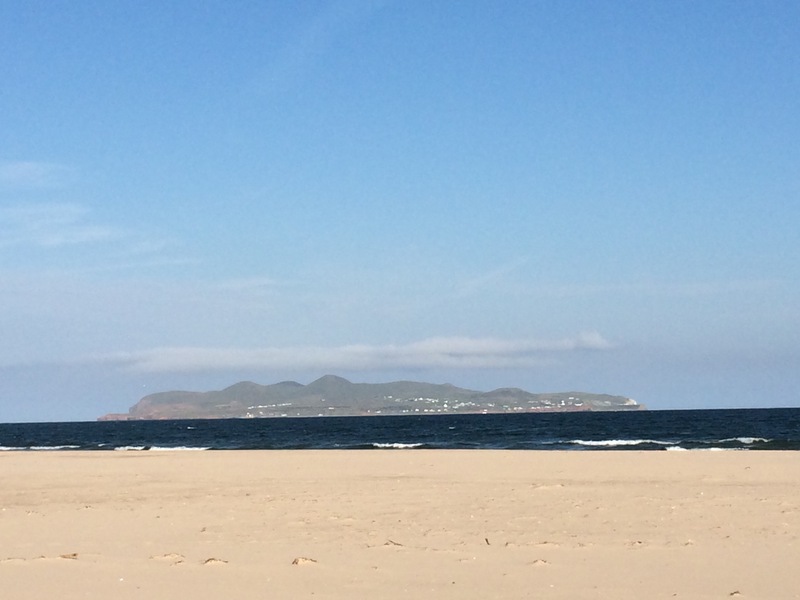 The views were certainly worth the struggle crossing the beach against the wind. A benefit of coming in September is that we had the whole island to ourselves. I didn’t want to leave that place. A place to take a break…and never leave. Lots of great views on this hike. The wind fought us all the way across this beach but it was worth it. A great first day was capped off with drinks at local microbrewery A l’abri de la Tempete and a delicious meal at La Table des Roy. We can’t wait to see what the Maggies have in store for us today. Sometimes you live in a place your whole life, with natural wonders right under your nose and yet you never visit them. I lived in Nova Scotia for 26 years and have never been to the Cabot Trail (it’s on my list!). 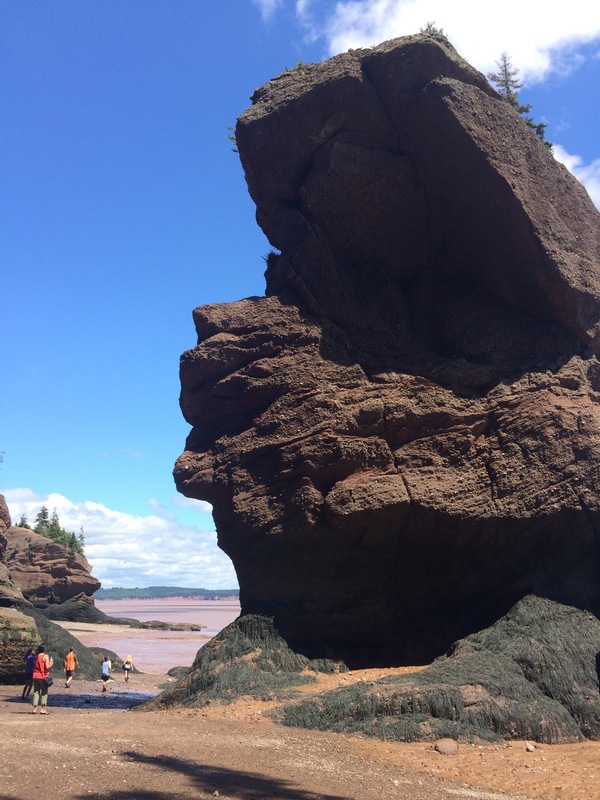 My husband has lived in New Brunswick his whole life and has never been to Hopewell Rocks. I hadn’t seen it either. We decided to go this weekend. 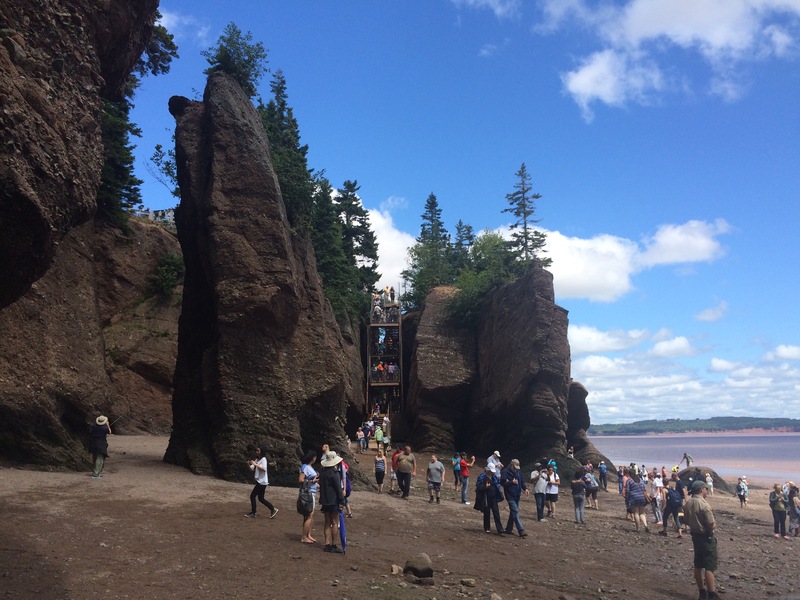 For those who might not know, Hopewell Rocks is an attraction along the Bay of Fundy that perhaps best showcases the magnitude and effects of the world’s highest tides. 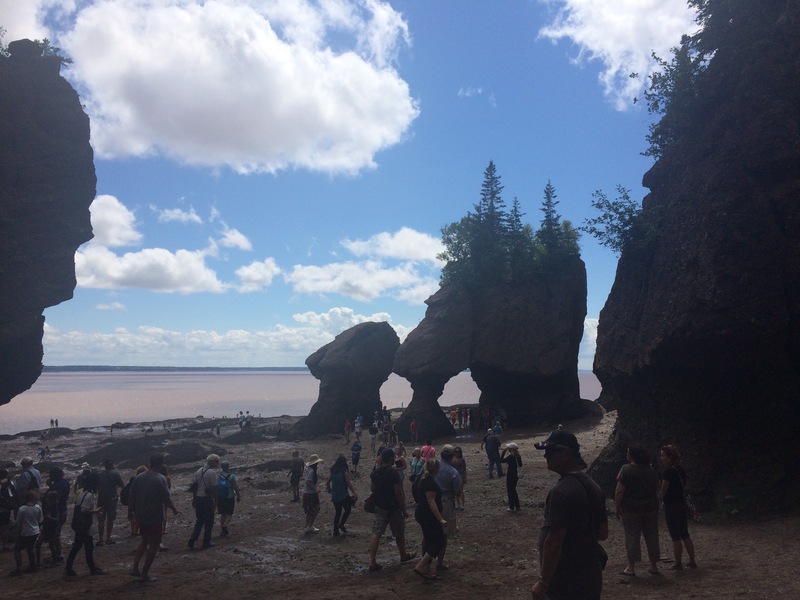 When the tide is out, visitors are able to walk on the ocean floor among sandstone rock formations, molded by many centuries of the tide’s forces. When the tide comes in, visitors (watching safely from an observation deck), can watch the waters rise 14 metres, erasing their earlier footsteps. The entrance fee for the park actually allows visitors to come back the next day to see both low and high tides. I was a little worried when we arrived at Hopewell Cape and saw how full the parking lot was. Uh oh, I thought, have we willingly entered a tourist trap? There certainly were droves of tourists. Inspection of some of the license plates in the parking lot showed visitors from all over Canada and the U.S. I needn’t have worried, however, because once you make it down the metal stairwell to the beach (don’t stop to take pictures on the stairs, people! 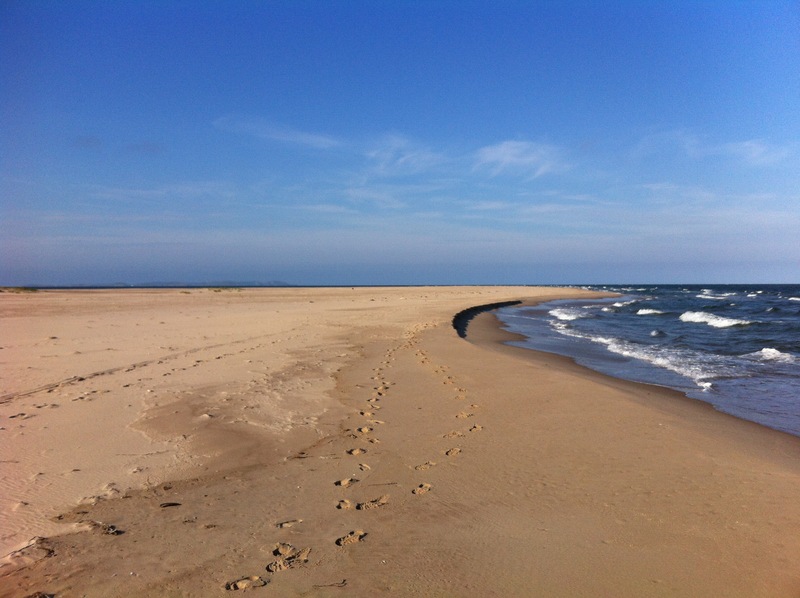 ), the space really opens up with over 2km of beach. I couldn’t believe how far it went. Every time you rounded the corner into a cove, you found there was another just behind it. 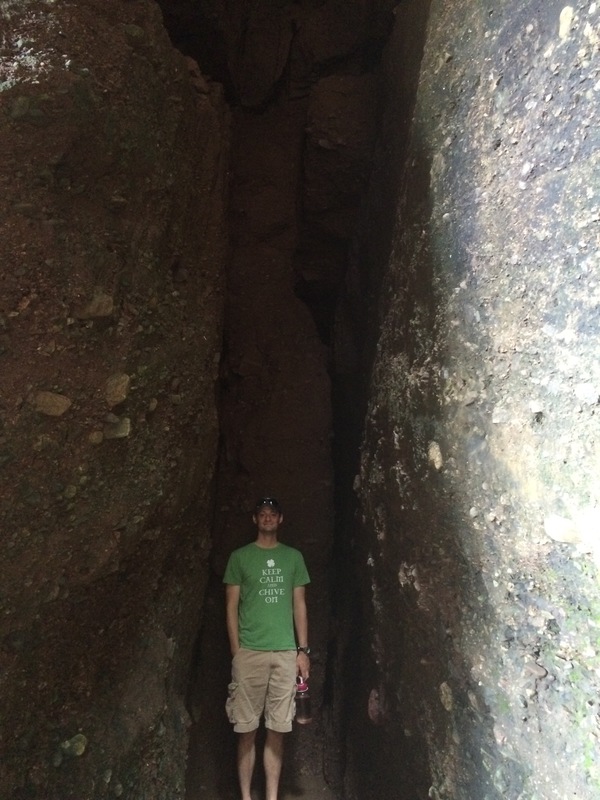 There are plenty of nooks in the rocks to explore and Joel had a fun time playing in the mud barefoot (free mud bath!). 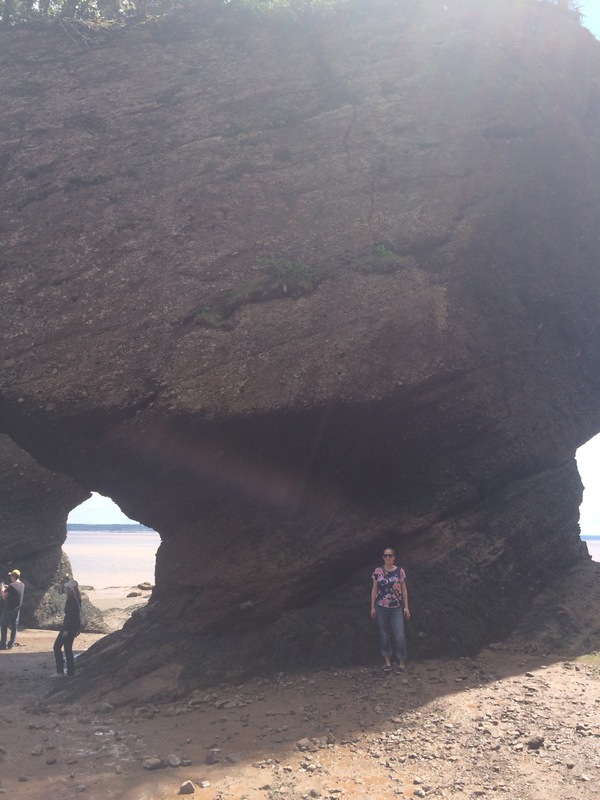 After fully exploring the beach and all the cool rock formations along the way, I have to say that Hopewell Rocks is pretty impressive and definitely worth the trip if you have not been. 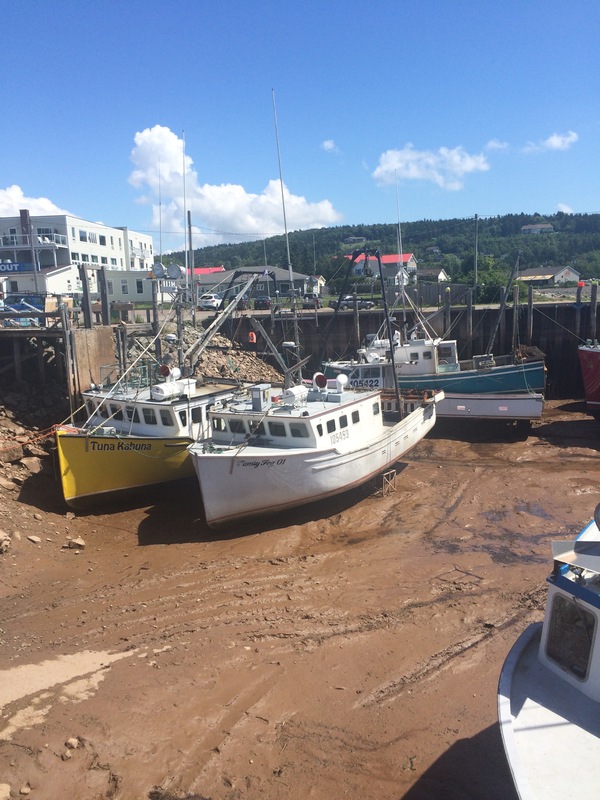 It gives you a deeper appreciation for the Bay of Fundy and just how powerful those tides really are. It was also great to see that the place is so busy and popular with visitors! I’d love to come back sometime to do the kayaking. Pit stop in Alma. Tide’s out! Perfect timing. Me under a Flowerpot. The water line is much higher than my head. 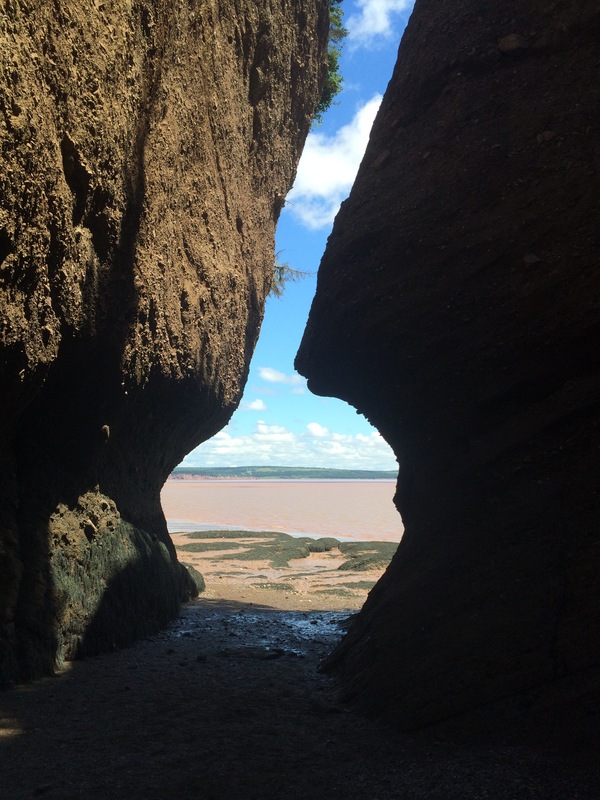 If you would like more information on Hopewell Rocks, please visit thehopewellrocks.ca. Happy New Brunswick Day! I love seeing so many photos of people enjoying this beautiful long weekend outdoors. It gives me a feeling of nostalgia for my childhood, when summers meant nothing but running free, fresh air and the smell of sunscreen. Culturally Unique – We are the only province in Canada with 2 official languages. 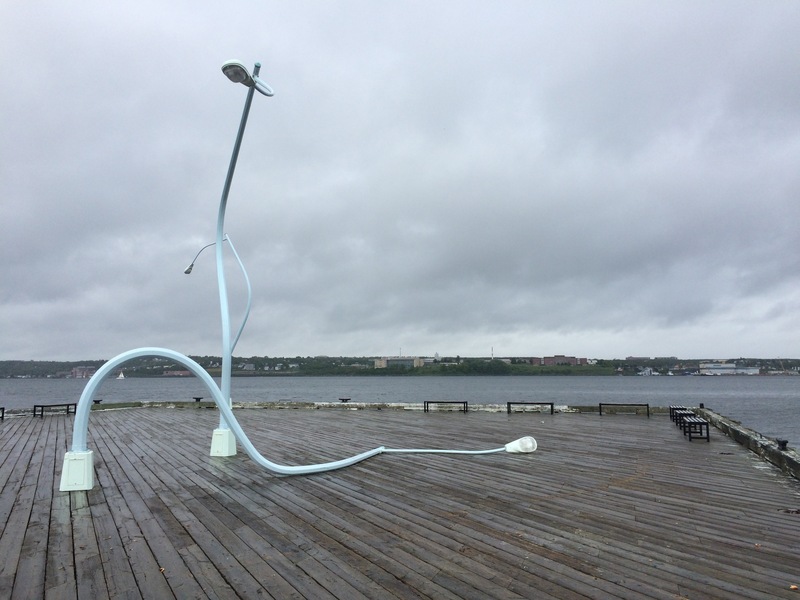 And while this sometimes creates friction in our province, it also makes us culturally unique and attractive to visitors. I think we need to embrace and celebrate our unique culture; it’s one of the things that makes us stand out among Canadian provinces. 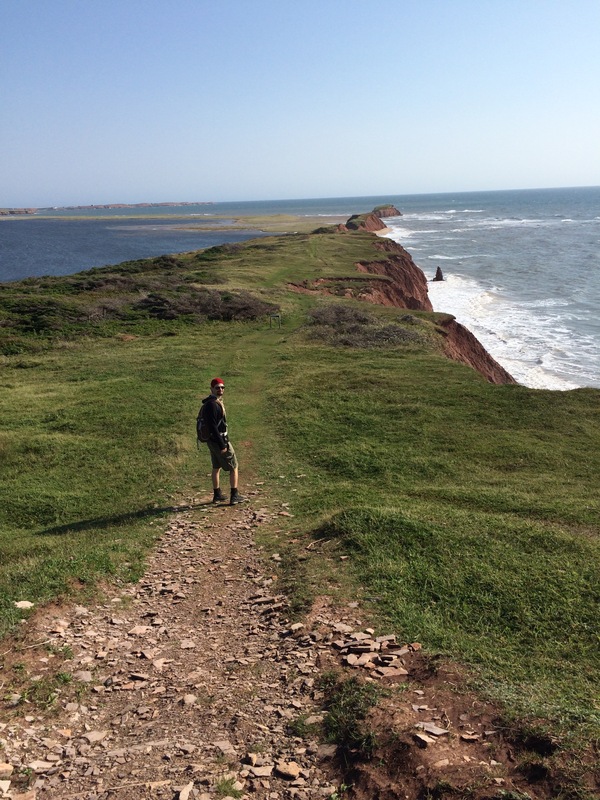 Hiking – NB has some terrific hiking. 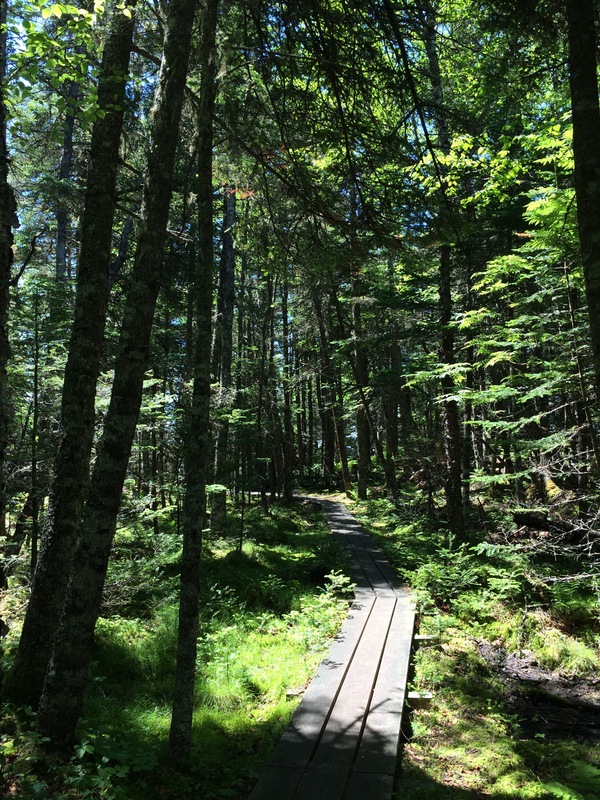 From the challenging and breathtaking Fundy Foot Path to Seek the Highest Peak at Mount Carleton and everything in between, we’ve got those nature lovers covered. 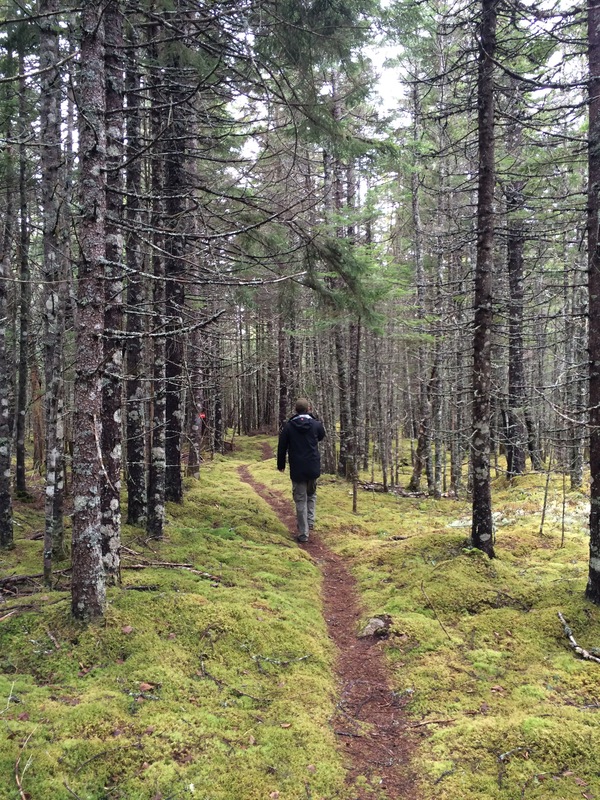 For more info on hiking in NB, visit nbhiking.ca. 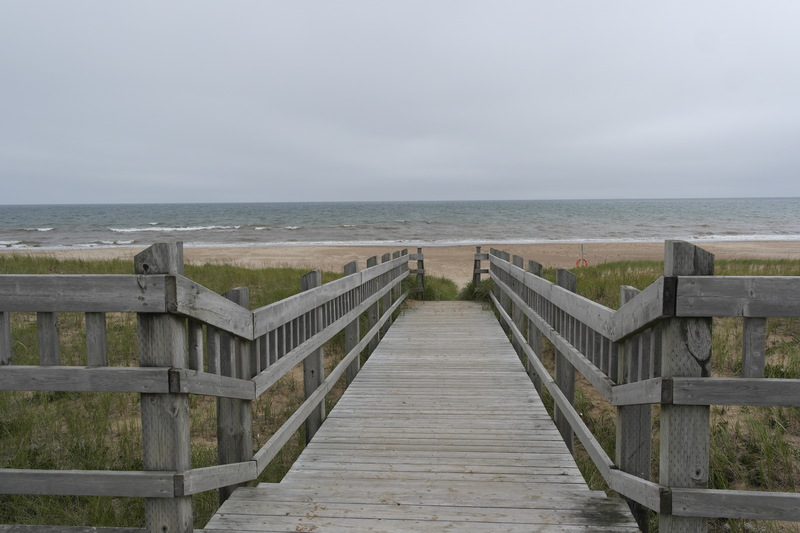 Beach Love – From our beaches along the Bay of Fundy to the Mac Daddy of them all, Parlee Beach on the Northumberland Strait, there are plenty of places to get your summer beach day on. 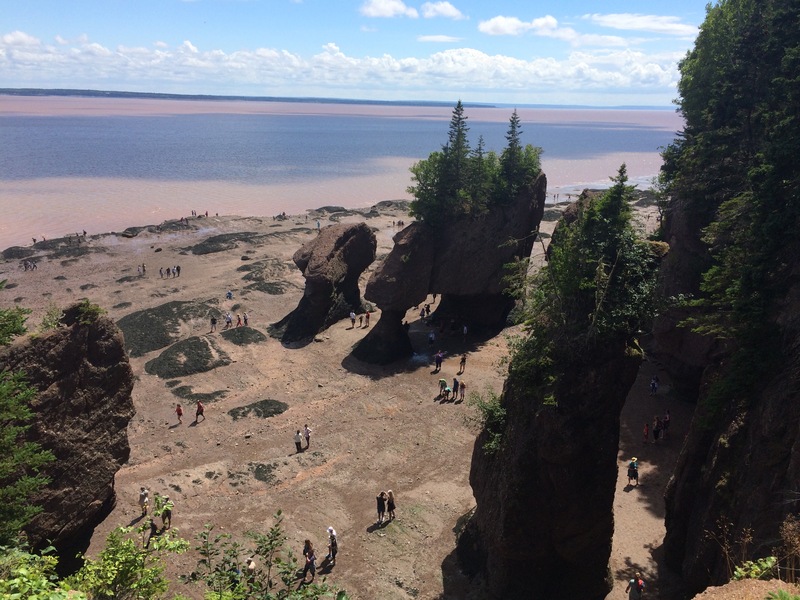 ‘Dem Bay of Fundy Views – From the uber-charming St. Andrews by-the-Sea to Hopewell Rocks, no visit to NB is complete without exploring this stunning shoreline and everything this natural wonder has to offer. 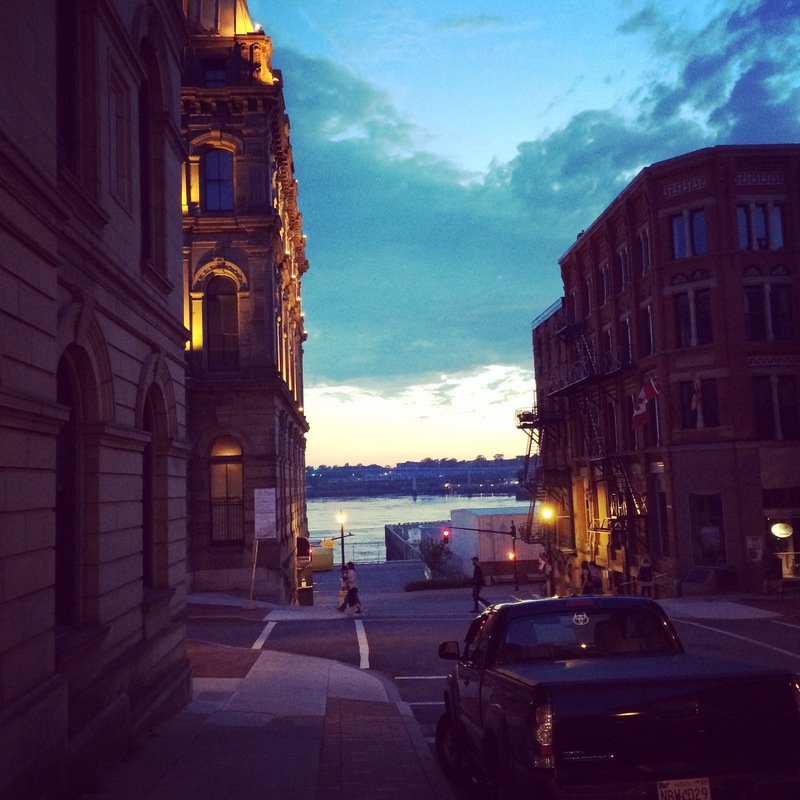 City Buzz and Country Charm – We’ve got the best of both worlds. Whether you are looking for a night on the town or a quiet cottage in the woods, we’ve got them both. You can even sleep in a treehouse in Miramichi, which I think looks really fun. 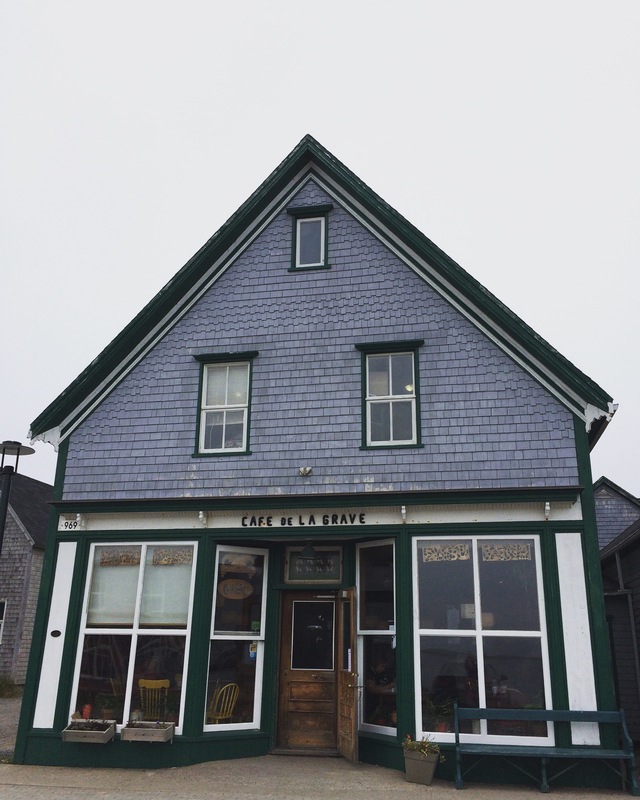 East Coast Hospitality – Just like Nova Scotia and PEI, we’ve got that east coast hospitality thing down. We love sharing our beautiful province with visitors and we’re more than willing to help you make the most of it. I swear, I’m not getting paid to say this stuff. 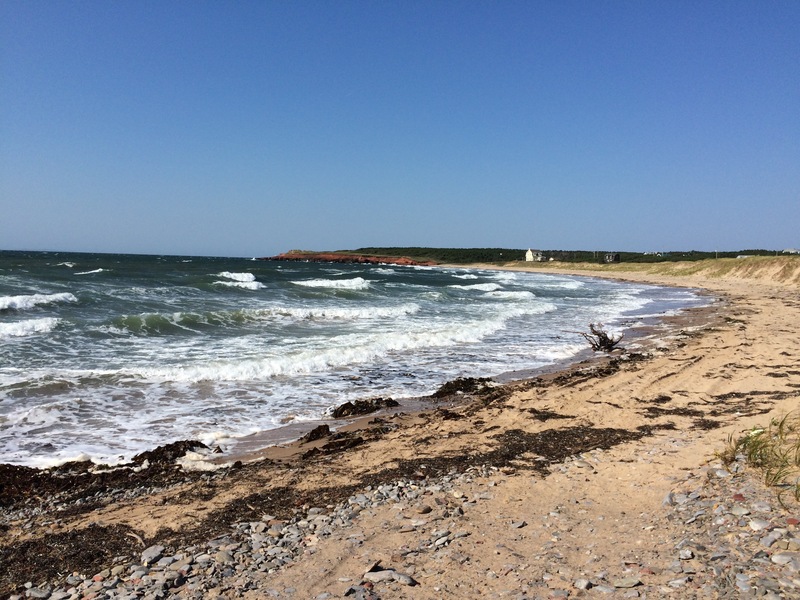 I’m just passionate about this province and I think it deserves to take its place as a premier tourist destination on the east coast, alongside NS and PEI. 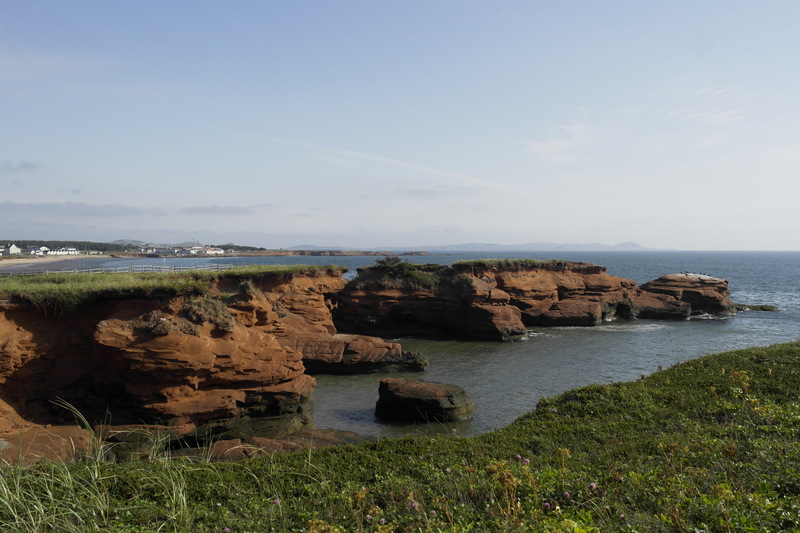 If you would like more information on tourism in New Brunswick, please visit tourismnewbrunswick.ca. I’ll leave you with a video that was released by the government of NB for New Brunswick Day, entitled, Why Do You Love New Brunswick? These have been some of the reasons I love NB, what are yours?